The Harman Built Fireplace Outperforms Every Other Fireplace on the Market. Most factory built fireplaces are built to meet a price point rather than a performance standard. For most manufacturers R & D means “research and duplication”. 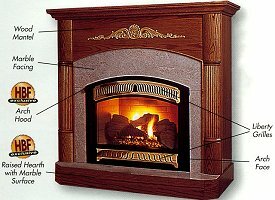 These manufacturers spend more time copying others and making a cheaper fireplace than they do trying to make a better fireplace. When Dane Harman decided to build a high efficiency fireplace, he started from scratch. He asked the people who sell fireplaces what they would want in their homes. From this research and using a 3D modeling computer system, he designed, then tested his innovative, high quality fireplace. The result is a revolutionary new concept in fireplaces that is just right for today's energy conscious family. You won't find a higher quality gas fireplace on the market today. Harman Built Fireplaces deliver heat, not hype. The efficiency figures and energy inputs we quote are conservative and reproducible by any testing lab in the country. Some manufacturers offer inflated efficiency ratings and heating capacity figures. They boost ratings by using atypical chimney configuration for their tests. 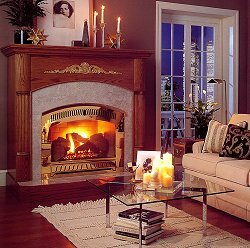 The fact is, Harman Built Fireplaces out-heat all other similar looking fireplaces on the market today. With the price of energy today, efficiency and heat output are more important than ever! The technology that gives Harman Built Fireplaces the heating edge is simple, but effective. An accordion shaped heat exchanger, located directly above the fire, exposes a large surface area to the intense heat of the fire. 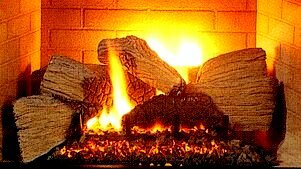 Ordinary fireplaces have no provision for extracting this extra heat. They may look pretty on the outside, but they just cannot deliver the heat and optimum efficiency that is possible. Harman Built Fireplaces offer the best of both worlds - heating efficiency and great looks. To boost heat output and efficiency even further, the Serenity III Fireplaces incorporate a special damper system, which moves more room air over the accordion heat exchanger so that more heat is extracted. This innovative system dramatically boosts the cubic feet per minute (CFM) of air moved and consequently increases heating transfer efficiency. Ordinary fireplaces have optional blowers, but the fact is they don't move much warm air. You can always find a less expensive fireplace, but you'll never find one that is better built than a Harman. If you are like most homeowners you want lasting value. The Harman Built Fireplace will burn significantly less gas than ordinary fireplaces and is engineered to withstand the rigors of continuous use, year after year. The Harman Built will cost a bit more initially, because it costs more to build, but in the long run it will be a better value. Please click here for a large view of all of these features. 12 Gauge Welded Aluminized Steel Firebox - Guaranteed For Life. Check out the fireboxes of ordinary fireplaces and you'll find thin galvanized or untreated sheet metal fireboxes that are pop riveted or spot-welded together. These lightweight fireplaces are not made to withstand a lifetime of heat stress or resistance to corrosion. Harman-Built Fireplaces are. 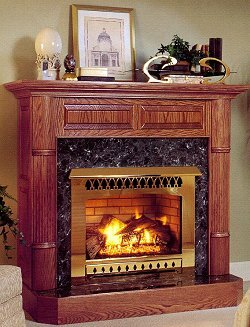 Most homeowners do not realize that gas fireplaces generate a significant amount of moisture during the combustion process and that fireboxes can therefore corrode over time. The Harman Built design addresses this issue by using a very heavy 12 gauge material that is aluminized to resist corrosion. This choice of material has a proven track record in high heat environments where moisture is present. No other fireplace on the market is built with such a durable firebox material. Harman Offers a Better Warranty Than Other Manufacturers. The firebox on a Harman Built Fireplace is warranted for life. This means that if the firebox ever fails in your lifetime it will be replaced. The warranty is transferable, should you sell your home. Other manufacturers may claim to offer a lifetime warranty, but it simply is not true. Be sure to the read the fine print. Under Harman's Gold Warranty Program the burners, valves and electrical components on all Harman Built Fireplaces are warranted for three years and this includes the labor to install the replacement parts. 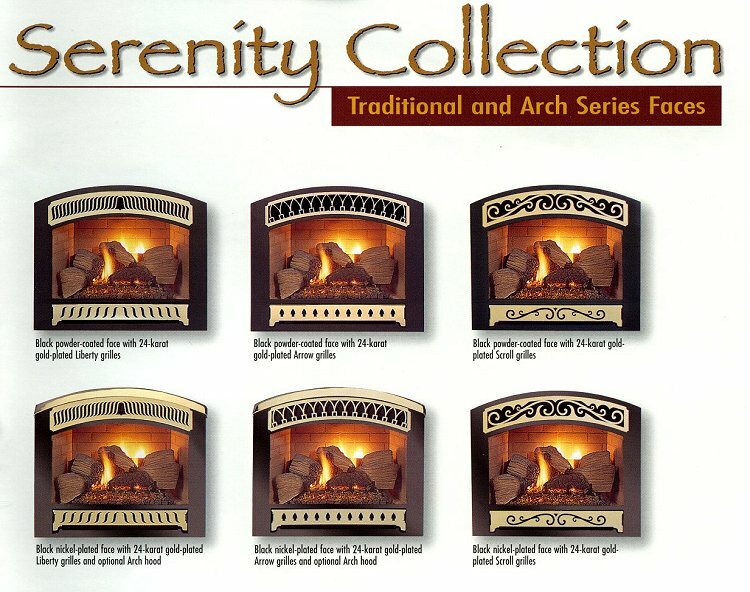 Choose from a wide selection of traditional or contemporary fireplace faces, mantels and facing materials. The Harman-Built mantel and facing system lets you select a finished look that is right for your home. You select the fireplace face, mantel style and color, and the tile or marble-like surround you want from the Harman catalog and it is delivered to your dealer as a complete package. 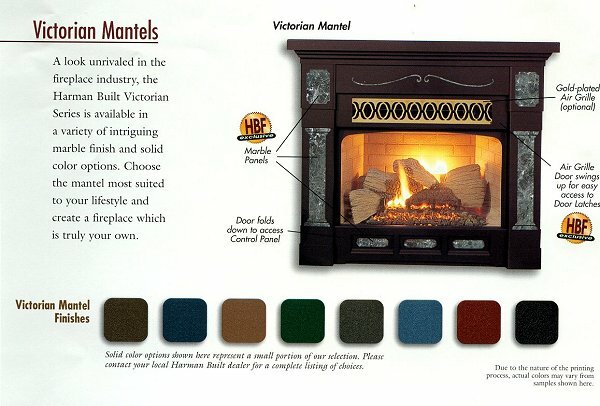 Click here for an example of Victorian Mantel Finishes. There is no need to spend time sourcing mantels and facing materials in hopes that they will work with your fireplace. The mantels, tile or marble-like surrounds and the fireplace faces are easily assembled, and a dream to install…. So you won't need one contractor to do the carpentry work and another to do the marble or tile facing work. Anyone who can use basic carpentry tools can install a Harman Built Fireplace. Harman arched and rectangular faces attach without fasteners so you won't see ugly screw heads on the face, like you see with other brands. This innovative system also allows you to change faces easily, should you decide to change your homes décor. The fire viewing area is approximately 1 ½” higher and 1” wider than other similar looking models. The fireplace viewing area is more vertically oriented - that is, more “portrait” like than “landscape”. When you look at other brands they are low and wide - a look that is typical of California, but just doesn't look right in New England. 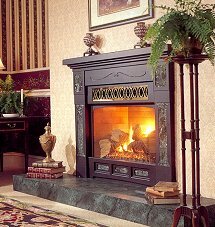 In addition there are no obstructions in the firebox of Harman Built Fireplaces, so the fireplace looks much like a real masonry fireplace. 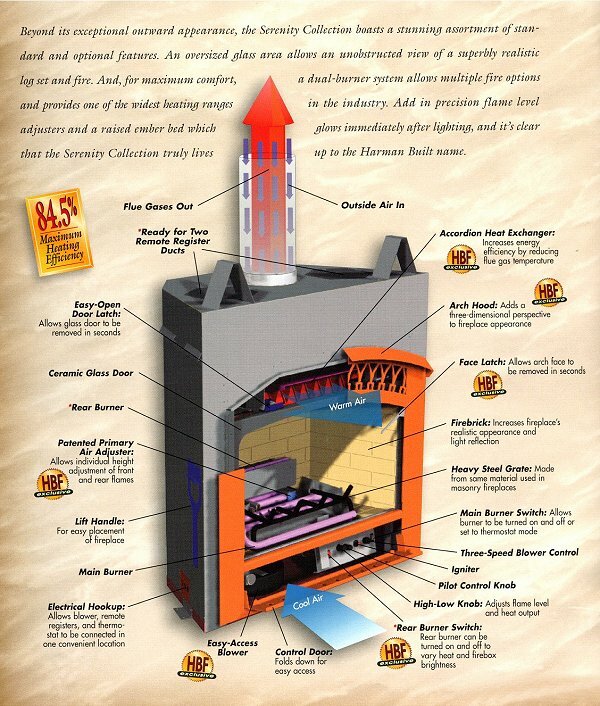 Other brands have unsightly projections above the fire at the back, which detract from the appearance of the firebox. The realistic log and embers used in Harman Built Fireplaces gives you a good combination of yellow flames and glowing embers. Most fireplaces give you one or the other - either lots of bright yellow flames and very little glow or lots of glow and no fire. Some look good at high heat output settings, but not on low. The Harman Built Fireplaces are engineered to look good at both high heat output settings and low settings. Keep in mind that most homeowners do not operate their fireplaces on high all of the time. The Serenity III Fireplace has a rear burner that can be turned on either manually or with an optional remote control, to throw extra heat and light out into the room. The burner adds about 25% more heat output. During the spring and fall when heating demand is less the burner can be turned off. Easy Access to Components That Your Installer and Serviceman Will Love! When you or your serviceman need to clean dust and pet hair from the convection air blower the job is easy. Just lift the blower out for easy access. It is this attention to detail that is one more reason to choose a Harman Built Fireplace over an ordinary fireplace. Harman Built Fireplaces Can Be Installed In Many Locations Other Fireplaces Can't. The standard vent pipe on a Harman Built Fireplace is larger than most of the gas fireplaces on the market. 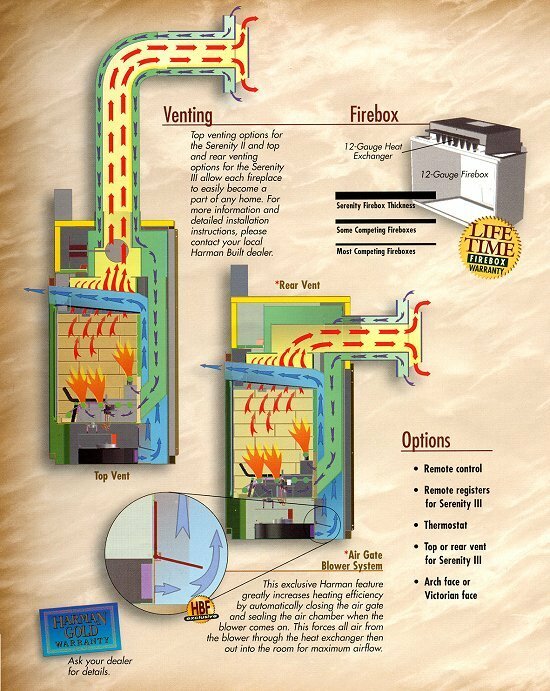 This gives you a broader range of venting and installation configurations to choose from. 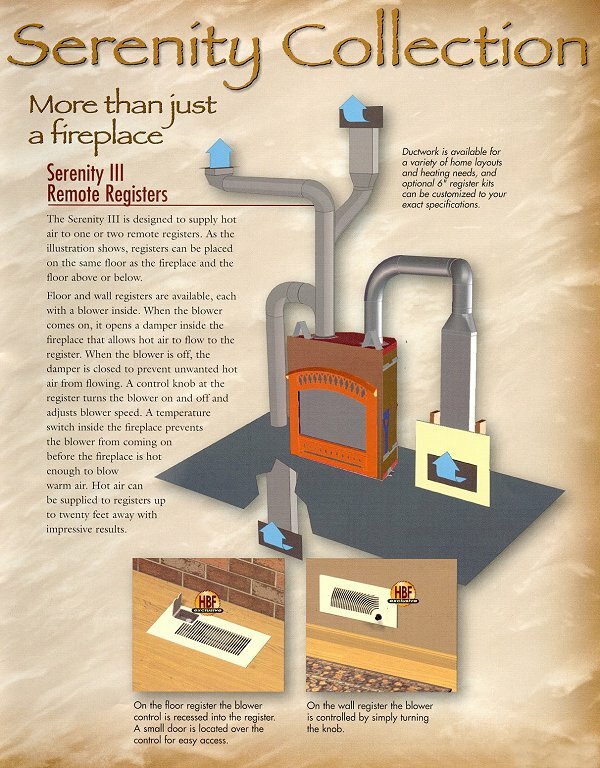 The Serenity III Fireplace for instance, can be installed up to 8 ft from the outside wall of your home, without the need to run the vent pipe up through an upstairs closet or bedroom. Both 5" x 8" and 4" x 6 5/8" vent pipe can be used, and this gives you the broadest range of venting configurations you'll find on a direct vent gas fireplace. Top or rear vented options add to installation versatility as well. Please click for view these options. While other manufacturers offer many items like blowers and firebox liners as accessories, Harman's philosophy is to give you what you need upfront. Harman-Built fireplaces come complete with a high quality ceramic firebox liner and a blower. You select the face style you want, and whether you want a wall mounted thermostat or a remote (or both) and your fireplace is ready to install.